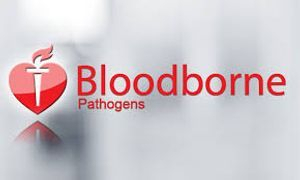 Bloodborne Pathogens is a classroom course from that teaches employees how to protect themselves and others from being exposed to blood or blood-containing materials. This course is designed to meet Occupational Safety and Health Administration (OSHA) requirements for bloodborne pathogens training when site-specific instruction. Course Format: This course is classroom-based with emphasis on 29 CFR 1910.1030(g)(2) which requires employers to provide training to any employees who have occupational exposure to blood or other potentially infectious materials. Standard 29 CFR 1910.1030(b) defines, "occupational exposure" as "reasonably anticipated skin, eye, mucous membrane, or parental contact with blood or other potentially infectious materials that may result from the performance of an employee's duties". If an employee is trained in first aid and identified by the employer as responsible for rendering medical assistance as part of the employee's duties that employee is covered by the bloodborne pathogens standard.